Yesterday, April 4th, must have been quite a day for astrophotographers. 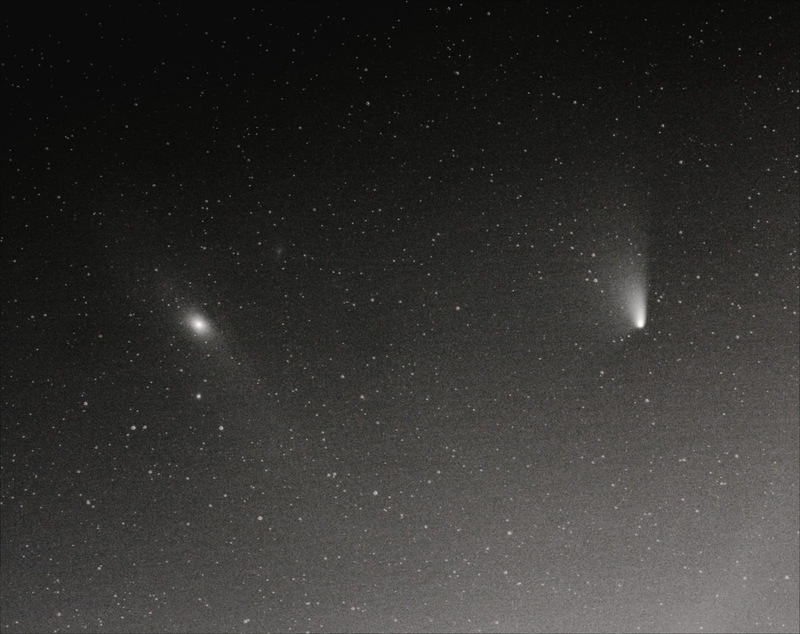 The comet C/2011 L4 (PanSTARRS) was as close as it gets to the Andromeda galaxy. I also went outside in hope of catching the view on camera. The weather could have been better. There were thin clouds obstructing the view and spoiling my photos. Comet itself was quite easy to find although there was no chance of seeing it with naked eye or even through camera. I pointed my camera to where I knew Andromeda was and after couple of shots I had them both on image. If you know what Andromeda looks like, you can see it. I've taken a lot better photos of Andromeda before. Now it was too early for that. Also the gradient is quite disturbing. I've heard IRIS might be able to remove the gradient. DSS certainly did not.